Charles the Bold was married three times. The first two marriages occurred when he was the Count of Charolais before he became Duke of Burgundy. His first marriage, when they were children, was to Catherine of Valois, daughter of King Charles VII of France. Catherine died on July 13, 1446. His last and most famous marriage, soon after he became Duke, was to Margaret of York. His second wife was of Isabella of Bourbon. Isabella was born sometime in 1436. She was the daughter of Charles I, Duke of Bourbon and Agnes, daughter of Duke John the Fearless of Burgundy and sister of Philip the Good, Duke of Burgundy. When Isabella was a young girl, her parents sent her to Burgundy to be raised by the Duchess, Isabel of Portugal. Duchess Isabel was mentor to many noble girls and nieces of her husband. She supervised Isabella’s education and enjoyed the young girl’s company. Isabella was a shy young woman. Duke Philip kept his eye on her. She was docile, compliant and lovely and living right in his household. 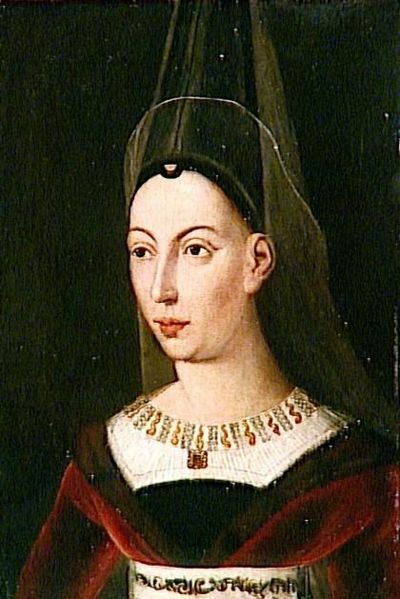 Early on, Philip considered her as a bride for his son Charles, Count of Charolais and important to making an alliance with King Charles VII of France. Duchess Isabel was worried about Isabella’s presence at court because she was an advocate of an alliance with England, not France. Due to the Duke and Duchess arguing over whom their son should marry, Philip stalled any alliance Isabel tried to make for many years. He did not want to leave Burgundy knowing Isabel would take any opportunity to marry their son to an Englishwoman. In April of 1454, Pope Nicholas V asked Philip and other rulers of Europe for help in a crusade to fight the Turks. Philip also received an invitation from the Holy Roman Emperor Frederick III to attend a meeting of the Imperial Diet at Regensburg. Philip was eager to attend this meeting in hopes of recruiting others to raise troops for the crusade and in promoting his request for an imperial crown for himself. At the same time he knew Isabel would take advantage of his absence to arrange an English marriage for their son. He obtained a release from the Pope allowing Charles and Isabella to marry as they were first cousins. He needed a French alliance to recruit Charles VII and his troops for his crusade. At first Isabella’s parents were pleased with the alliance and agreed to Philip’s request for the French Chinon territories in the dowry. Philip heard rumors that Isabel was influencing their son to make an English marriage and even to refuse the French marriage to Isabella. This worried Philip so much he finalized the betrothal without royal approval or even approval of Isabella’s parents. He then left for Regensburg. Philip traveled east to Nevers and met with his sister Agnes and the Duke de Bourbon, Isabella’s parents. The Duke de Bourbon was now not willing to cede the Chinon territories to Philip. Bourbon asked King Charles VII to mediate the dispute. The negotiations dragged on for weeks. In the meantime, Philip sent word to Charles to marry Isabella immediately based on the early terms of the betrothal or he would disinherit him. The couple was married on October 31, 1454 at Lille. Isabella wrote to her parents announcing the marriage and there were no further objections to the marriage or the dowry. Duchess Isabel however was stunned and found the marriage hard to accept. She even went so far as to withhold customary ceremony due to Isabella. Charles left soon after the marriage to attend to duties as governor of Burgundy in his father’s absence. Eventually Isabel and Isabella reconciled and they left in December to go to Bruges together. In 1456, Duchess Isabel handed over a large number of her own servants to Isabella and Charles. In August of 1456, the French Dauphin Louis fled from an army his father King Charles VII had sent against him, seeking refuge in Burgundy. Duchess Isabel and Isabella, who was pregnant at the time, greeted Louis in Brussels. On February 13, 1457, Isabel gave birth to a daughter. Charles had left to go hunting as soon as she went into labor. Duke Philip asked not to be disturbed unless the child was a boy. Only Duchess Isabel was in attendance with the Dauphin Louis outside the door. Isabel carried the newborn girl to the Dauphin. He asked that the child be named Mary after his own mother Marie of Anjou. The child was baptized a few days later. She was brought back to her mother’s room and placed on her bed. Many ladies and gentlemen entered the room and they were served crystallized spices and hippocras. In August of 1461, Louis was crowned King of France at Reims and Charles and Isabella attended the ceremony. For the rest of their marriage, Charles and Isabella were relatively happy even though Charles was away from Isabella and their daughter Mary for long periods of time. Charles was singularly faithful to Isabella. Isabella began to suffer from a fatal illness, probably tuberculosis and died on September 25, 1465, alone at Les Quesnoy. Charles had left to fight in France against King Louis along with other disaffected French nobles. He was negotiating a peace treaty at Conflans when he received word that Isabella had died. He did not return for her funeral. Duchess Isabel mourned the death of Isabella but within weeks, she sent an embassy to England to broach the subject of a marriage between Charles and Margaret of York. Isabella was buried in a magnificent monument in the abbey Church of St. Michael near Antwerp. The tomb was destroyed by radical Protestants in 1566 but a few of the mourning statues from the monument were saved and are on display in the Rijksmuseum in Amsterdam. 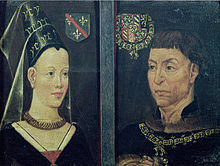 Charles and Isabella’s daughter Mary would inherit the Duchy of Burgundy in 1477. Excellent retelling of Isabella’s life when married to Charles. What chattel women were in those days! !